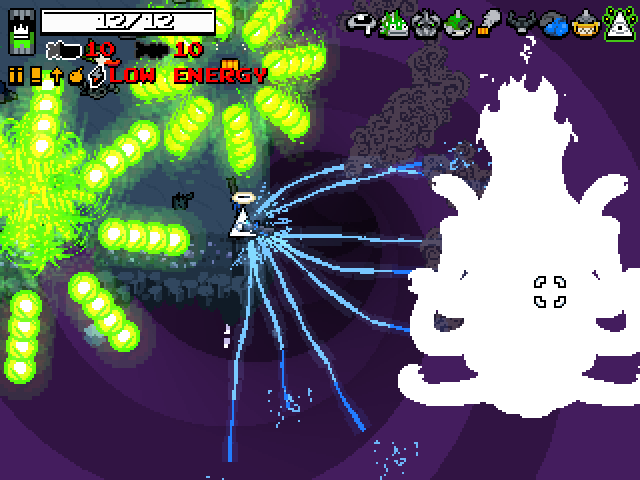 I've released my online multiplayer mod for Nuclear Throne just a bit over two weeks ago. That was interesting. I had since received a plenty of feedback, bug reports, and feature requests. Today I've released what can be considered a major public update, and this is a small average-sized post about interesting things in it. That's an alright thing to do for a single-player game - when the player picks an UM, you just set the global variable to 1\2\3, and that's it. However, with multiple players, this approach presents a bit of a trouble - firstly, you can't check if the player's race index is equal to a value, because there are multiple players. And you can't check the number either, because the players would probably want to pick different UMs if they are playing with different characters. And then there's a small helper function which counts how many characters of a particular kind there are to scale effects accordingly. Of course, the largest amount of time was spent on deciding how every UM should work with multiple players, but that's a less interesting story full of tough decisions. In the end, character-specific UMs were made to apply only to character(s) of the given race, while the global\passive UMs would apply to everyone. While this removes a couple of potentially funny combinations, this is about as balanced as it gets. While seeking through bits of the game related to this, I was also able to revisit how particular abilities work with multiple players, and whether they can\should "stack". 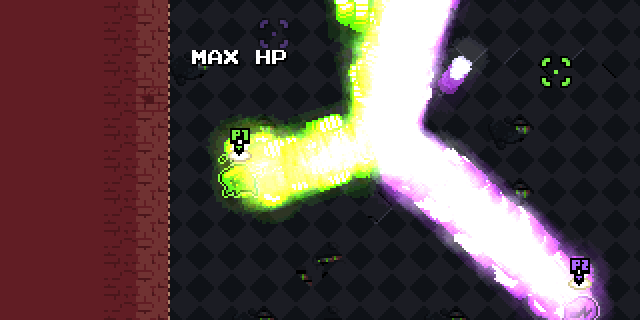 So with two "Eyes" characters you can pull enemies even faster, with 2x "Rebel" you can have some ridiculous quantities of allies, and with 2x "Horror" and some planning you can have your very own giant annihilation beam (pictured). As you may know, conventional game streaming can be hardware and network intensive, since the computer has to record, compress, and transmit a video in realtime. It's not always that you have a computer and an internet connection capable of streaming a game in decent quality. Spectating is a pleasant alternative - since it uses a similar approach to replays (replicating actions by storing player inputs for each frame), the amount of bandwidth used is minimal (~1KB/second per viewer), and so is the resource usage. Aside of obvious uses, this also allows for a curious workaround - if you need to stream the game, but cannot do so for technical reasons, you can have a trusted person spectate your session and do the actual video stream of that. With a bit of technical knowledge (running multiple Steam + game instances via Sandboxie), this can also be used to provide commentary during tournaments on multiple player's views with minimum latency and technical requirements for players. Overall this is an interesting feature and I'm curious to see what people will do with it. Finally, there's a whole bucket of various smaller fixes, tweaks, and additions. There's ~80 of these in total so I'll cover a few interesting ones. "chat bubble" now appears above the players while they are typing. This is a pretty small additions, but regardless useful, as it allows to tell whether the player is trying to say something or they are just waiting for you to proceed. Non-keyboard controls now also work while chatting, so getting hit by small melee enemies while typing should be less of a problem now. Another small-but-noticeable tweak is to how weapon pickups work. 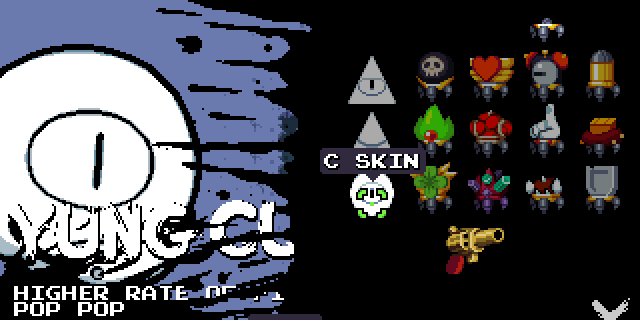 "Vanilla" Nuclear Throne would display names of each weapon in ~16px proximity. This is generally okay, but, on a few occasions, multiple weapons may be found lying close enough to mash their captions into a curious pile of symbols. The matter of which weapon you would pick up on such occasion is an even more curious one and dependent on weapon's creation order. NTT now only displays the name of the weapon that is the nearest to you, and pressing the button will always pick up only that exact weapon. Combined with a slightly-smarter algorithm for pushing weapons away from each other, this makes it easier to look through any piles of these and pick what is intended. You can now also play as Y.C. (Yung Cuz) as a second alternative skin to Y.V. For those unfamiliar, Y.C. is a secret in NT, which makes a brief appearance as an NPC, earnt some popularity with the public, and apparently was being considered to be made a secret playable character. Unfortunately, for unknown reason(s), the idea of playable character was ultimately scrapped, despite the game assets containing a full set of artwork and audio files for the character. With little to no data known on what the character's abilities should have been, any implementation would have been a speculation at best, so this is likely the best possible option. As per usual, there's also a plenty of bugfixes for various issues found. You can download the update (and/or support mod' development) via ThroneButt or itch.io. Your mod is fab and me and my friend enjoy the game a lot. Before, we were getting super salty whenever we tried to play vanilla coop because of all these bugs and problems, you know. We appreciate the great amount of work you’ve put into this, it made the Throne great again. One question though – is it possible to jump into replay to play it with two players? It is – you need to “stream” the replay, and have each of the players view the according replay player when hitting dropping into the replay. Awesome! Gonna try this with my friend today. Thanks for the comment! btw we want to replay our last run mainly because my game crashed while exiting the Y.V.’s mansion minilevel. 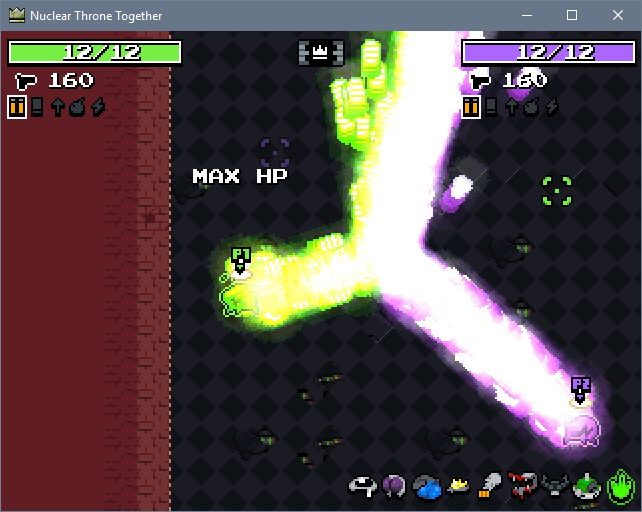 another bug we had with this mod was when we were shooting the hell out of the throne and it just wouldn’t die (although I don’t know exactly much dmg we’ve put in it’s face, just it felt unnaturally long compared to previous runs and yes, we had good guns [two steroids with jackhammer, grenade rifle, hyper slugger and smth else, shooting nonstop while standing under the throne until we stopped and it crushed us]). Um not sure how to pull this off. Whenever one of us is streaming the replay, the other player does not see any local nor public games to join. How to join this replay? Okay I’m pretty sure we figured it out – you start streaming a replay and then just invite a player via steam to join in. It was not working few first times hence our doubts. One thing still seems to be a problem – can we fast forward a replay faster than just 4x? Even for replays 12 minutes long it’s a bit too slow.